For the pollsters it’s clear: for the first time ever, a majority of Germans are now critical of Angela Merkel. EURACTIV’s partner Tagesspiegel reports. The numbers speak for themselves: Chancellor Angela Merkel and her Christian Democratic Union (CDU) party have lost a great deal of public confidence due to their handling of the refugee crisis. Their provisionally low approval rating was established at the weekend by the Emnid polling agency, on behalf of Bild am Sonntag. If a general election were to be held today (19 October), then the CDU and CSU (Christian Social Union in Bavaria) would only garner 37% of the vote. The coalition has not polled this low in two and a half years. If the opinion polls of the INSA and Forsa agencies are to be believed, which put the CDU/CSU union at 38%, then they have lost 4% in just two months. Hermann Binkert, head of INSA, commented that the figures show “a profound swing in opinion”. 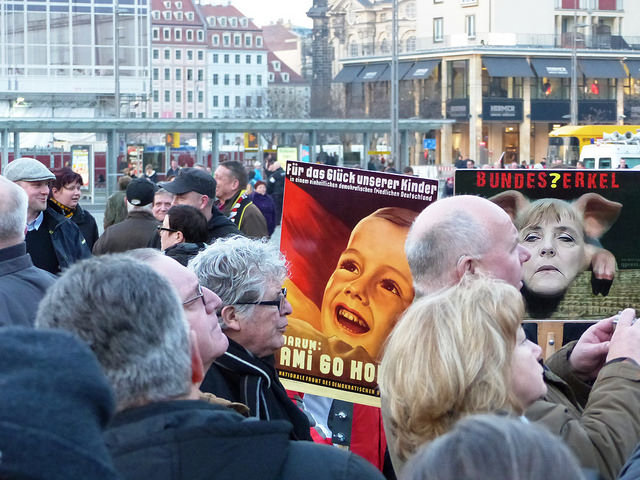 The cause of the German public’s rapid loss of faith in its government is clear to the pollsters: Federal refugee policy has been met with increasing voter scepticism. Data from 9 October shows that 45% of Germans believe that the country can deal with the amount of refugees being accepted, while 51% doubted it could. This shows a significant change of opinion from September, when 57% believed that Germany was capable of absorbing the number of asylum seekers. Angela Merkel has acted as a lightning rod for criticism. Her approach to the refugee crisis, symbolised by her “We can do it” and “The right to asylum knows no borders” soundbites, has cost the previously lauded queen of the polls dearly. According to data collected by INSA on behalf of Focus Online, around 33% of Germans believe that it would be right of her to resign. When Merkel had to contend with the financial crisis back in 2008, she put her own credibility on the line when she said, “Your deposits are safe.” Now the Chancellor appears not to be taking such personal leaps of faith. Richard Hilmer, the former head of Infratest-Dimap, an electoral research provider, said that “the feeling is growing, that the policy is out of control”. Merkel is predicted to bear the brunt of dissatisfaction and to be made “personally responsible for everything that happens from here on in, be it negative or positive”. Werner J. Patzeit, a researcher at Dresden’s technical university, said that “up until now, Germans have had almost blind faith in Angela Merkel. Now is the first time that a majority of the population are against her. Many people are of the opinion that Merkel is no longer doing the right thing”. However, party expert Timo Lochocki of German Marshall Fund Berlin said that “the Chancellor has so far not been challenged politically in terms of the run up to the parliamentary elections in 2017”. Additionally, Forsa’s Manfred Güllner does not believe that there will be a “change of mood” in this regard. Nevertheless, according to Patzelt, these developments could be “dangerous” for Merkel. After all, the Chancellor has passed a point of no return now and there is little chance of being able to change course. This article was previously published by EURACTIV Germany. Decisions that will affect all Europeans like those concerning the migrant crisis cannot be made any longer by a politician who is part of a national government. We need a European president, or at least an executive with those powers. Can’t agree with that either, we could end up with a President from a country that lives of the subsidies of those that are paying all the bills making decisions that pick our pockets further without ever having to consider the impact it would have on their own economy. He who pays the piper should call the tune.